PHP Editor SSH - why, you may ask? The goal of PHP IDE is to serve all of PHP developer's needs - including those that are not directly related to the task of writing PHP Code. 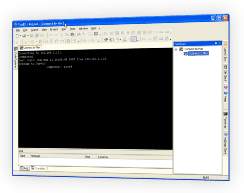 PhpED is a unique PHP IDE because of its integrated terminal accounts allowing you to access the remote computers via telnet or Secure Shell (SSH) with out ever leaving the IDE. The expertise of NuSphere's development team goes far beyond the php debugger and advanced PHP Editor features - we are also experts in networking and remote file access solutions. PhpED's PHP IDE SSH account almost literally brings the security and the convenience of SSH to your finger tips. 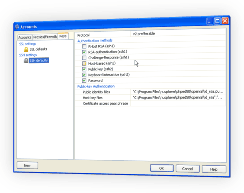 PHP IDE SSH account can be setup using PhpED's Tools->Accounts GUI. To setup new SSH account you need to select New-Secure Shell (SSH) from the Pop Up menu of the Terminals item in Tools->Accounts GUI as shown on the picture. If you didn't select Save password (which is recommended security practice) you will be promoted to enter the password and the username for SSH account. The properties of PHP Editor SSH terminal as well as other terminals can be adjusted to your liking. Select Tools->Setting->Tools->Terminals and set the settings to your preferences. In this tutorial you learned about PHP Editor SSH controls available in PhpED and simple and convenient ways to create and use SSH accounts and terminals. It is also worth mentioning that PhpED's php debugger can be configured to use SSH for communications the IDE. You can get additional information about PHP Editor SSH on NuSphere Forum. Download a free trial of our PHP IDE today!